This is a festival I remember as a child when I was living in Asia. It happens when the moon is full around the Autumn equinox, to celebrate abundance and togetherness. Everyone hangs colorful lanterns, and it was a very special occasion for me because I got to pick my own lantern. The traditional food is the 'moon cake‘, a delicious pastry made from lotus beans. 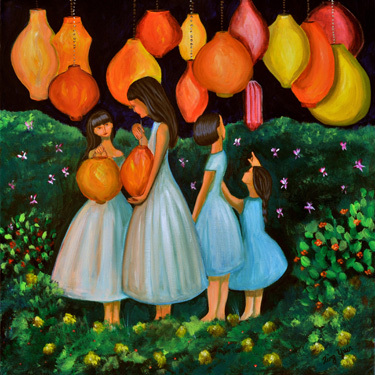 After the evening meal, my sisters and I would go for a walk with the neighborhood kids to admire all the beautiful glowing lanterns.